Photo taken from the movie Hero by Zhang Yimou. In the movie Hero the same portion of a story is told four times, each time with a different color (red, blue, green, and white) and a slightly different plot to the story. Each time the story is told the main characters, Flying Snow and Brocken Sword have a different relationship and their actions in the story are different. For the final scene, they wear white and they are purely together as they die and things become calm and simple, as seen through the color white. Denotations: In the scene Brocken Sword had just died or is in the process of dying white the sword in his chest. Flying Snow calmly talks to a dying Brocken Sword saying that they will be going home, and Flying Snow kills herself with the sword that is killing Brocken Sword. The film also cuts to where Nameless is confronting the king and in that chaotic part of the scene there is all black. Lastly the backdrop for the white scene is the natural dessert landscape instead of the colored backdrops for the other colors such as in the red scene all of the leaves building being red. Connotations: Although Flying Snow was the one to kill Brocken Sword when she charged at him, he took the hit, completely giving into the blow and not trying to block himself with his own sword. He calmly let into death. Looking more closely at the last part of the scene where Flying Snow is whispering to Brocken Sword telling him how they are going home together. There is a calm in the part of the movie even though she had killed her lover she is calm as she believes that they will travel together home. Also to bring in the natural landscape (as this white scene is the only one to have the natural setting), when Flying Snow says they are going home, that home is that they are returning to is the nature as represented in the natural background. The white robs that they are wearing represents the purity. Yes Flying Snow kills Brocken Sword but as they die they are finally together, deigning together with the one that they love and at peace with that. This is seen in the way that Brocken Sword does not fight Flying Snow and instead lets him kill her. He is giving into the one he loves because he would rather die than fight her back. Together they are dying by the same sword yet they could not look more peaceful and pure as they sit together with the wind moving their spotless white robes. It inflicts the pure calming feeling even after the deaths of two lovers. This entry was posted in Fashion and Gender in China, The Cinematic - Fashion in Film on May 4, 2016 by mfichter. In mid to late 60’s China a movement was created. First by student from wealthy military families who did not believe in the teachings they were receiving in school, so they retaliated against their teachers and their principles. Soon students everywhere were refusing the teachings of the school and brutally beating their school administrators. These children labeled themselves Mao’s red guard and wore either their parents or homemade Mao suits, which were truly old army issued uniforms. The Red Guard linked itself to Mao at first but soon he saw the movement of children as a way to bring forth the cultural revolution. Denotations: The image at fist glance just looks like a mob of hands and the color red. 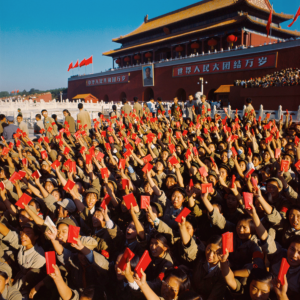 However with closer examination these are all students probably both male and female, at a rally with their Mao suits on and their little red book with Mao’s words in them. In the background there is a political building with a very large image of Mao posted on it. In half of the photograph it is a sea of green and red. In the upper half there is the red political building with Mao’s image and a brilliant blue sky above that. Connotations: The mob of children that appear mohave no gender but seem to be passionately supporting a cause have completely lost their individuality. Instead of seeing individual students there is instead one group, one cause, one goal. The suit that each student is wearing itself represents unity and also power. Having been what military men used to wear the suit itself carries an “air” of power with it. Especially with such a large group of people wearing the suit it is almost like an army. The same goes for the abundance of the color red, which also represents power, just adding to the “army’s” status. The political building (the gate of heavenly peace) in the background with Mao’s image, that is directly behind the students but also above shows how the students are ultimately under Mao’s control. He is further from the foreground of the picture but he the ruler, he is control of this united group. They have united under him and for him and for their country. The bright blue sky represents how the students believed that what the were doing, and even what Mao himself believed, that they were doing what was best for the country, so that it could be better. This bright blue represents the happiness that the Red Guard and Mao believed they were creating. is it better to organize the denotation components and critical connotations in a side by side fashion? This entry was posted in Fashion and Gender in China, The Socialist - Mao suit on March 30, 2016 by mfichter. The qipao began as long lose fitting clothes, that had draping sleeves and skirts. The beginning of the qipao was at the time in Chinese history when the Manchu people took over. This loose clothing fit what the Manchu people valued, work. Before the Manchu took power, Chinese women could not really work because of their bound feet. 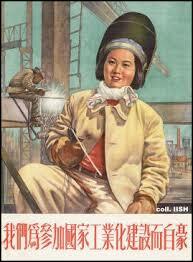 However the original qipao would allow woman to still work. The qipao changed over time. It became shorter and tighter with small sleeves and slits. This is drastically different from the original qipao, but soon the new qipao became hugely popular world wide. At one point the qipao was not thought of as appropriate dress by the Chinese government but since there was so much popularity of the dress world wide, the qipao was brought back to its home of China. In the photo above the woman is wearing a qipao at the time of its “home-coming”. This is a new qipao with a shorter hem. There are two long slits going up the womans’ dress. This qipao has the classic high collar neck and button up neck opening. There is also small cap sleeves. The material and pattern of the qipao seems to be traditional (silk and floral pattern). However the rest of the photo has western elements. The woman’s shoes appear western. Her hair looks a lot like how woman had their hair in the 20s in America. The room itself looks western with the leather couch and little decoration elsewhere in the room. The whole picture suggests the mixing of Chinese and Western style, while the qipao has some of the similar elements of the original dress, it is different. This new qipao has western influence but it is still sexualizing the female body. The woman is seated facing the camera in an “inviting stance”. This sexualizing of the female body works in both Chinese and the Western ways of life. This in turn implies that the meaning of the qipao was changing to sexualizing. This is a stark contrast to the original qipao that was shapeless. The new qipao now stands for femininity and the coming together of the Chinese and Western world. This entry was posted in Fashion and Gender in China, The Modern - Qipao on March 1, 2016 by mfichter. Foot binding was the sign of beauty for women in China of this time period. In order for a woman to be thought of as beautiful her feet needed to be between 3-5 inches. This type of mutilation of the feet was necessary for women to be married, and especially if they wanted to marry a wealthy man. Tiny feet represented femininity and civility for Chinese women during the Neo-Confucian era of China. If a girl had tiny feet but a plain face it did not matter she still embodied beauty and sensuality, and would be able to be married. 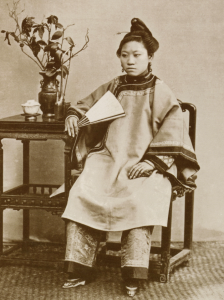 The photograph above would have been a posed shot of a Chinese girl of some wealth, taken by a Western Photographer. The photograph shows a young girl seated, not looking directly at the camera. She has her hair pinned up in a style that would been seen of other women in the time period. She is wearing long draping clothing that covers most of her body and fears out at the arms and at her knees. Her pants and sleeves seem to be highly embroidered. It is hard to tell from the colorless image but the cloth especially on her legs looks like it could be a silky material. The full attention of the view is drawn to the tiny feet just poking out of the long embroidered pant legs with beautiful embellished shoes. Lastly the girls face is plain with a blank stare. There is no make up on her face and no sort of embellishment around it. The plain face and the plain long putter shirt take the attention away from the girls head and has the viewer looking down towards the beautiful pant legs and the tiny little shoes that are almost lost in the pants. The size, shape, texture, and style of the clothing makes the body seem hidden. As if it is swimming in all of this cloth and is lost until the view sees the tiny feet. The feet are also hidden away but the sea of cloth above it makes the feet look so dainty. rich source of denotations and what does it suggest? Except for the face and the hands no other part of the girl is being shown, and her feet are almost being hidden. This adds to the mystery. Men of this time would have never seen the women with unbound feet, even when they were married. The beauty was in the concealment. The men would have to wonder what the feet looked liked because women tried to hide them away, like seen in the photograph above. The girl is seen with a plain face but yet she is still considered very beautiful, the beauty of the girls face really does not matter much at all. What matters is how small she can make her feet and how well she can draw attention to them. By embellishing the lower half of her body the girl has everyone looking for her tiny feet and not at her plain face, and she is considered very beautiful. how does the notion of beauty find explanations from those denotations?